The deep freeze finally left us, y'all. A week of frozen streets has warmed up into a beautiful late winter with hints of early spring. One can only hope that a true spring is right around the corner at this point. That, or gosh, let us enjoy the winter weather instead of being stranded indoors for days by it! While we were fully prepared for the first snow-week here in Atlanta, we unfortunately were not for the second. In fact, the second week came as a surprise to me. I really didn't pay attention to the weather reports, and, as a result, we were a bit low on our pantry supplies just one day into the ice-down. Nothing like a short-stocked pantry to get the creative cooking juices flowing! After a few days of buffalo chicken sandwiches born out of freezer supplies, we were itching for a dessert. Something sweet to go with what was soon going to be freezer meal #5. Something that we could pretend was an early Valentine's Day treat. And something that didn't require any box mixes, baking soda or anything more than just half a stick of butter. Thankfully, a quick web search came to the rescue! 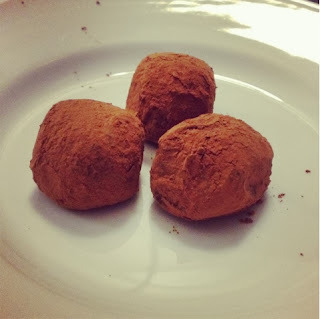 These red wine truffles were SO easy. Seriously. I am almost regretting giving this one up to you all, because then I won't be able to as easily "impress" when I show up with them at a party to come. But in the true spirit of stranded cooks everywhere, everyone should have a "gimme" recipe like this in their back pocket when the pantry goings get tough. Note: the real version of this recipe on the Two Twenty One blog sounds lovely, if you can make it to the grocery store for the actual ingredients :) But chocolate chips did wonderfully in a pinch! Bring cream to a simmer over low heat, and pour over chocolate chips and red wine mixture in a medium mixing bowl. Mix together until chocolate chips melt. Place bowl in the freezer for one hour, or the fridge overnight. Using a small spoon, scrape out enough chocolate to roll small 1/2 inch sized balls in the palm of your hand. Roll ball in cocoa before placing on serving plate. Store truffles in fridge, as they soften quickly at room temperature.